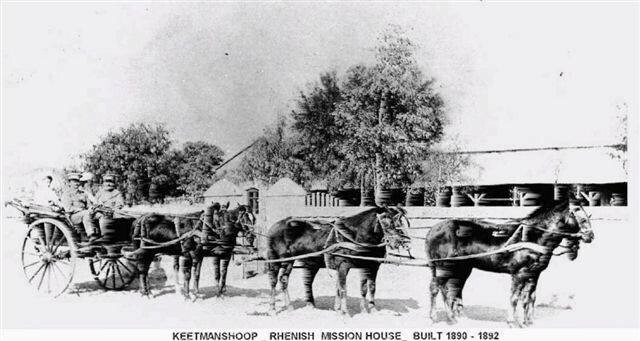 The Rhenish Mission Society played an important part in the development of Keetmanshoop, where Nama Kaptein Tseib and his followers had settled in 1866. The name of the settlement was then still Swartmodder or Zwartmorast (which respectively mean “black mud” and “black marsh”). The missionary Dr Carl Hugo Hahn had requested the Society to establish a mission station here. 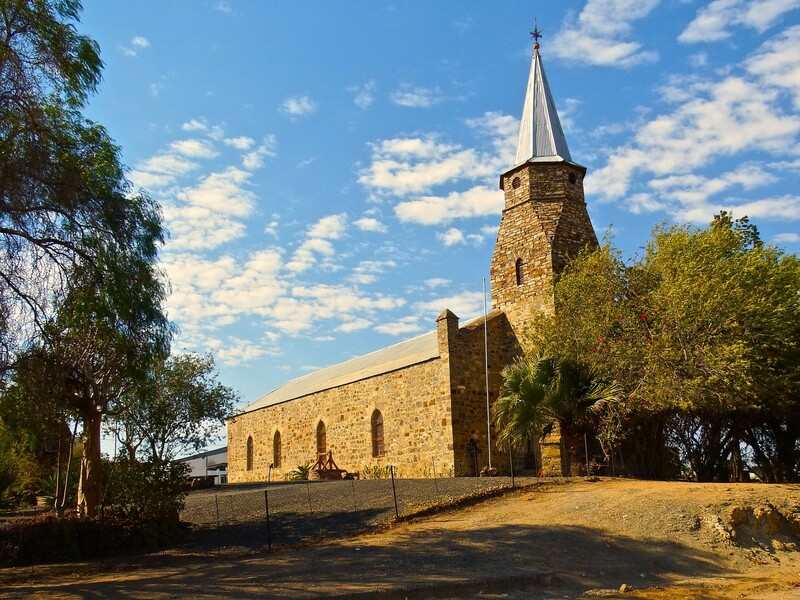 The erection of the first church was made possible by a private donation of 1,000 gold Marks from the chairman of the Rhenish Mission Society in Germany, a certain Mr Johann Keetman, in 1866. Since Keetman had invested a considerable amount, not only of money, but also of hope in the project, the village was named Keetmanshoop (literally, “Keetman’s hope”) after him. This first church was built by Rev. Tobias Fenchel. It was situated near the original spring in the Aub River from which Swartmodder had received its name. The church was washed away when the river came down in flood after a heavy rain in 1890, since nobody new that the shallow ground on which it stood was actually a dry river bed. The wooden pulpit and the altar Bible were later recovered downstream. It was then decided that a stone church should be built. 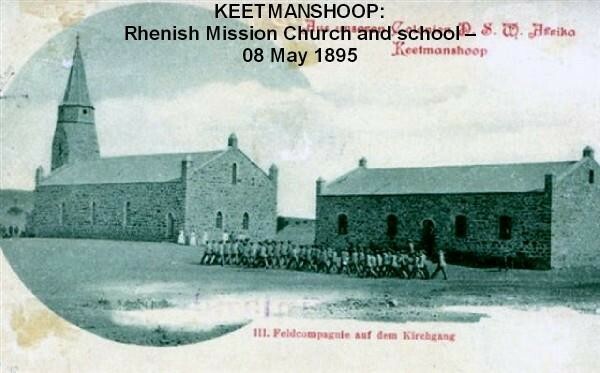 The site on which the church was to be erected was donated to the Rhenish Mission Society by Captain Tseib. The building materials were transported from Angra Pequena (now Lüderitz) by oxwagon. Rev. Tobias Fenchel, who supervised the construction, chose the church in his home town in Germany, namely Gambach, as the example for this one. The Nama members of the congregation helped to construct the church, which was consecrated on 8 May 1895. It was situated on higher ground than the first church, and was spacious enough to accommodate up to 1,000 people. 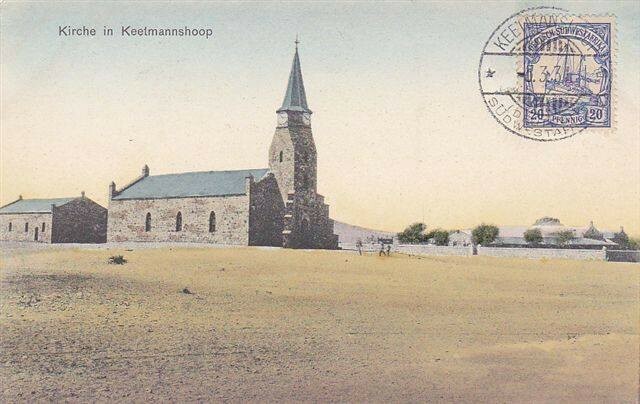 This church still stands today, and is the oldest building in Keetmanshoop. The Rhenish Mission Church is situated in Sam Nujoma Avenue in Keetmanshoop. It was proclaimed a national monument on 9 June 1978.